We describe enhancements to the pre- and postcondition technique that help specifications convey information more effectively. Some enhancements allow one to specify redundant information that can be used in “debugging” specifications. For instance, adding examples to a specification gives redundant information that may aid some readers, and can also be used to help ensure that the specification says what is intended. Other enhancements allow improvements in frame axioms for object-oriented (OO) procedures, better treatments of exceptions and inheritance, and improved support for incompletely-specified types. Many of these enhancements were invented by other authors, but are not widely known. They have all been integrated into Larch/C+++, a Larchstyle behavioral interface specification language for C++. However, such enhancements could also be used to make other specification languages more effective tools for communication. Martin Büchi and Emil Sekerinski. Formal methods for component software: The refinement calculus perspective. 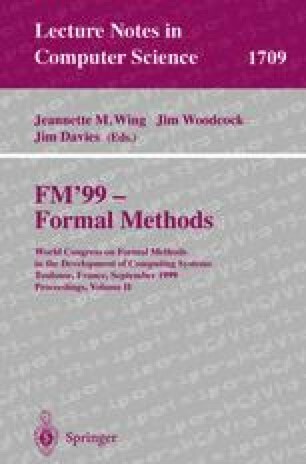 In Proceedings of the Second Workshop on Component-Oriented Programming (WCOP), June 1997. ftp://ftp.abo.fi/pub/cs/papers/mbuechi/FMforCS.ps.gz. Patrice Chalin. On the Language Design and Semantic Foundation of LCL, a Larch/C Interface Specification Language. PhD thesis, Concordia University, 1455 de Maisonneuve Blvd. West, Montreal, Quebec, Canada, October 1995. Available as CU/DCS TR 95-12, from the URL ftp://ftp.cs.concordia.ca/pub/chalin/tr.ps.Z. Gary T. Leavens. Larch/C++ Reference Manual. Version 5.41. Available in ftp://ftp.cs.iastate.edu/pub/larchc++/lcpp.ps.gz or on the World Wide Web at the URL http://www.cs.iastate.edu/~leavens/larchc++.html, April 1999.